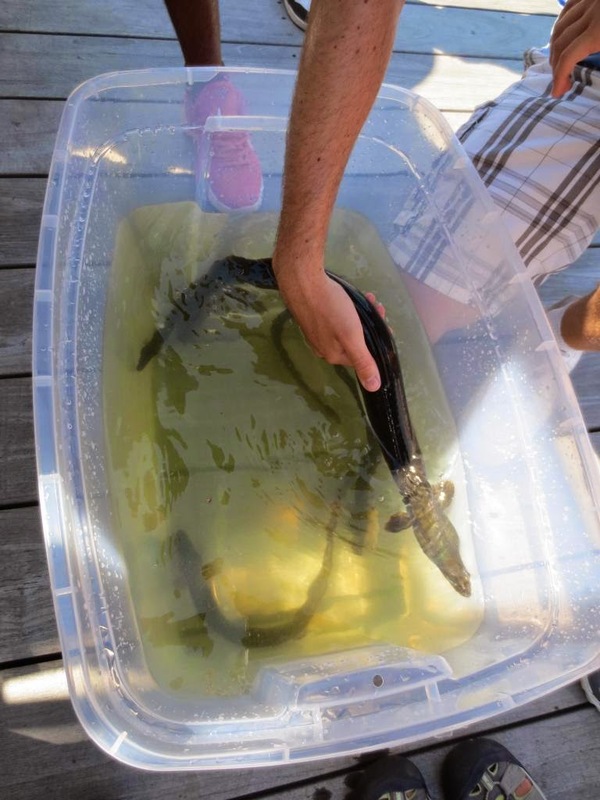 Hello again fellow adventurers, for the past few days at Courageous Sailing Center in Charlestown, a very odd looking fish has been captured on numerous occasions. Ranging from 3-5 inches, this curious critter looks like the result of some mad scientist's experiment to cross a fish and an eel. It has the body of an eel, the stereotypical long, slender body and a dorsal fin that stretches it's whole length; but it's head is not flat and elongated like that of an eel, and is instead shorter and thicker much like a fish. There are many speculations as to what this interesting creature could be. Bruce's first guess was that it was some type of mudskipper, a fish with strong pectoral fins which it uses to "walk" along the mudflats that they reside in. If this is a mudskipper, then it must be a juvenile, as it's pectoral fins are not yet strong enough to push its body across any surfaces. My best guess is that it may be a juvenile wolffish of some kind, as they are characterized by eel-like bodies with fish-like heads. 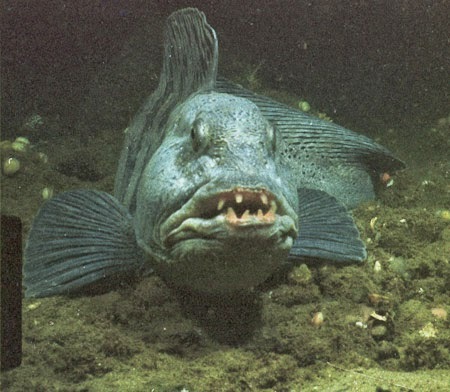 However, my only hesitation is that our mysterious specimen did not have the gruesome set of teeth that wolffish normally exhibit. As of now, the identity of this organism is still unknown, but I am not about to throw in the towel, and I will continue to search for answers and report back with my findings! He doesn't look as friendly as our fish!